While not a huge fan of the swatching process, I do swatch. In my own way. 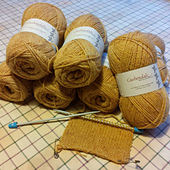 See below for proof of my swatching for Glenfiddich Cardigan. 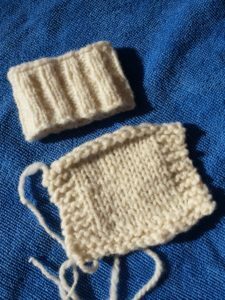 The idea behind swatching is to see how the yarn behaves; what it looks and feels like knitted up and to check for gauge. Frankly, when I want to jump into a new project, the last thing I want to do make a swatch. But in some instances, like when you want to make a sweater that will fit you, it is a good idea. Another aspect of making a swatch is to see what the yarn in the swatch fabric will do when washed and put through the paces. Some recommend carrying it around in your back pocket. But what kind of abrasion do you get from something comfortably enveloped in two layers of denim? 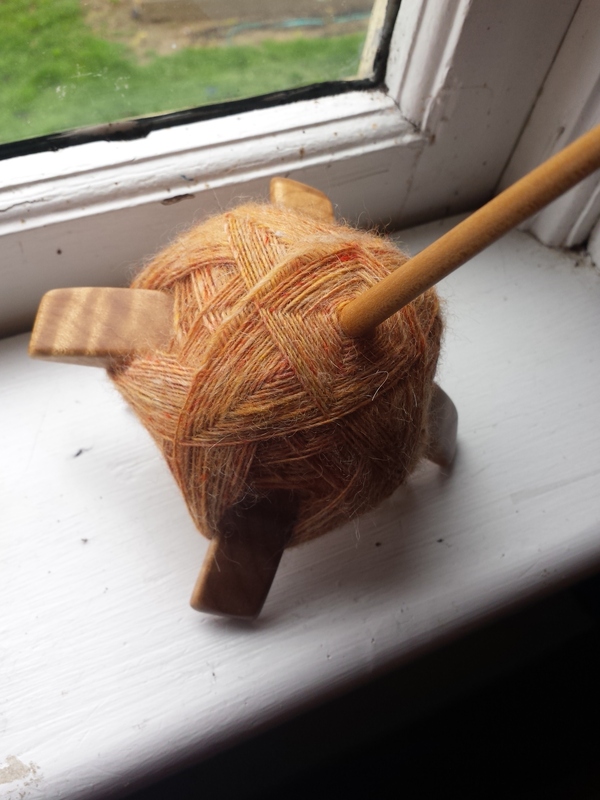 A couple of weeks ago I was out of town and I had my spindle with me. 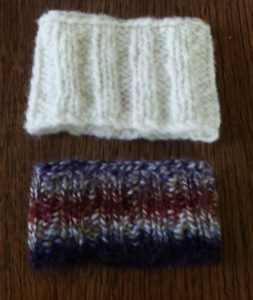 I have a collection wristlets that I knit up using scrap yarn to use as distaffs, or bracelets to hold the fibre. I didn’t have one with me, so I quickly knit one up using some of the leftover yarn from the second turtle I wound on the plane. That’s the multi-coloured one at the bottom. 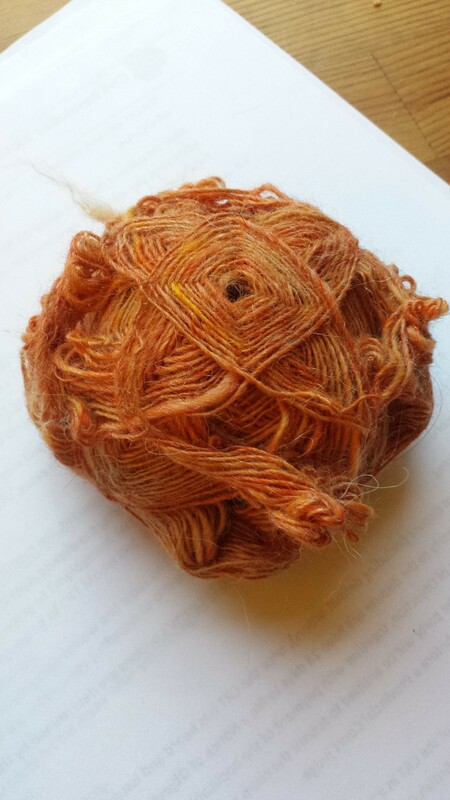 It’s a pretty thing and I enjoyed wearing it and using it to hold my fibre while I spindled. It was so lovely I kept wearing it long after I finished spinning. After having it on for the entire day, I noticed that this wee wristlet was getting some wear and tear. And then it occurred to me that this may be a better way to see how a yarn/fabric behaves. It certainly was put through the paces of being stretched as I pushed it up my arm to avoid getting wet, or if I forgot, it got wet, it was rubbed against things, and generally treated as any cuff would. So with the next fibre I sampled, Clun Forest from my neighbour up the road, I made a skein, washed it, and knit it into a wristlet. I wore it around for the day to get a sense of what that wool/fibre/fabric would feel like knit up into a sweater. The wristlet is on top, the unwashed swatch is on the bottom. The wristlet gave me much more information about the yarn than this swatch does. So, new discovery for me. It’s a beautiful and functional. My good friend Rachel confirmed this belief in her latest blog post. A wristlet is a practical way to swatch. It gives information about the yarn, about the size of needle to use, and most importantly, gives me a chance to really check for wear and tear. This entry was posted in Uncategorized on April 28, 2016 by DianaTwiss. Honey, why do you have so many spindles? I have to admit, it is an honest question. A dangerous question, but an honest one. There are three reasons why I have so many a wide assortment of spindles. I need an assortment of styles and sizes for my spindling instruction. 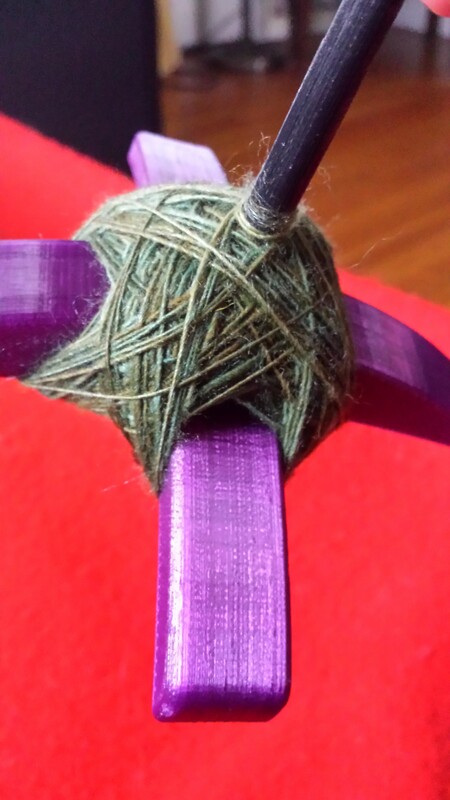 I teach people how to make yarn with a spindle: I work with absolute beginners to more advanced spindlers. People learning how to spin on a well-balanced medium-weight spindle (30 – 40 grams) have a greater chance of success and limited frustration in the learning process when they are working with a good piece of equipment. 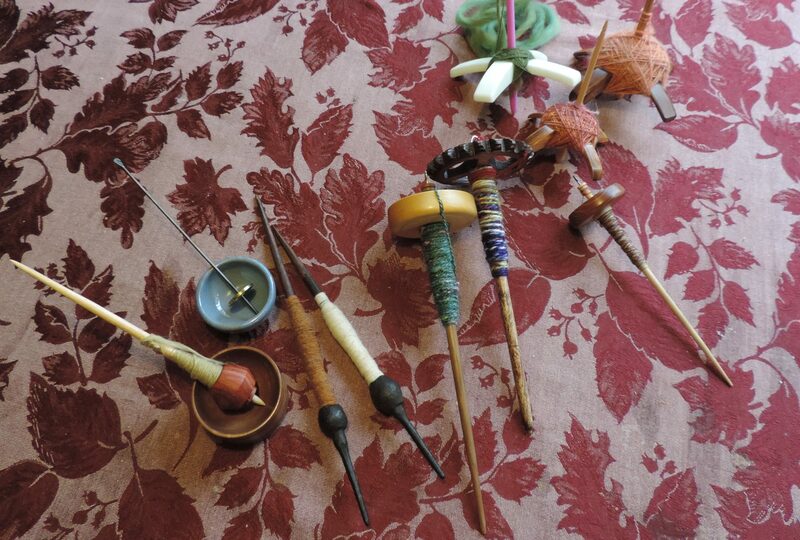 So I have several top-whorl spindles (enough to cover the entire class of eight) that participants can use during the workshop if their spindle is giving them grief. There are also people wanting to learn how to stretch their skills like learning how to spin cotton or short stapled fibres like cashmere. They want to move beyond the suspended (drop) spindle and move to supported spindles. They may simply want to try it out before they decide to jump in and buy one. For this, I have two Tahkli spindles, three Houndesign Little Twisters, three Russian Spindles, two antique supported spindles – stick and clay whorl – from Guatemala, and a Navajo spindle made by Houndesign. From left to right are the Little Twister from Houndesign; Tahkli; and the two antique spindles from Guatemala. 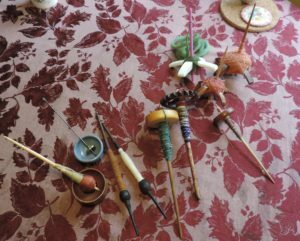 They may also want to learn how to work with a Turkish spindle. As a suspended spindle, it is similar to the others in the drafting and spinning process. Where it differs and people may want tips or practice, is in the starting and winding on process. So I have a fleet of Turkish spindles for them to use during the workshop. Below is one of them from TurtleMade. It is made on a 3-D printer. The spinning wheels that give us the greatest variety of yarns with ease are the ones with multiple whorls and drive options. Why not so with spindles? I have some spindles that are really light (16 grams) and have a smooth shaft, which allows me to spin off my thigh and put a LOT of twist into my yarn FAST. 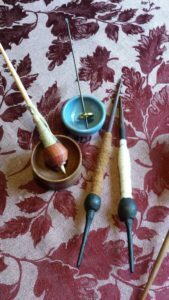 I also have a spindle that is heavy (50 grams) and as a Turkish spindle, it requires a flick of the fingers to get it in motion – much slower than rolling it off my thigh. Because of the weight of the spindle and the slower speed of the spin, the twist goes into the stretched out fibre slower than it does on the fast light one. I can take the exact same fibre, with the exact same fibre prep and spin on each spindle the light one and the heavy one – and I get very different yarn. In fact, I’ll do that experiment over the weekend and will prove it. So depending on the yarn I want to make and/or the fibre I am working with, I will select my spindle accordingly. 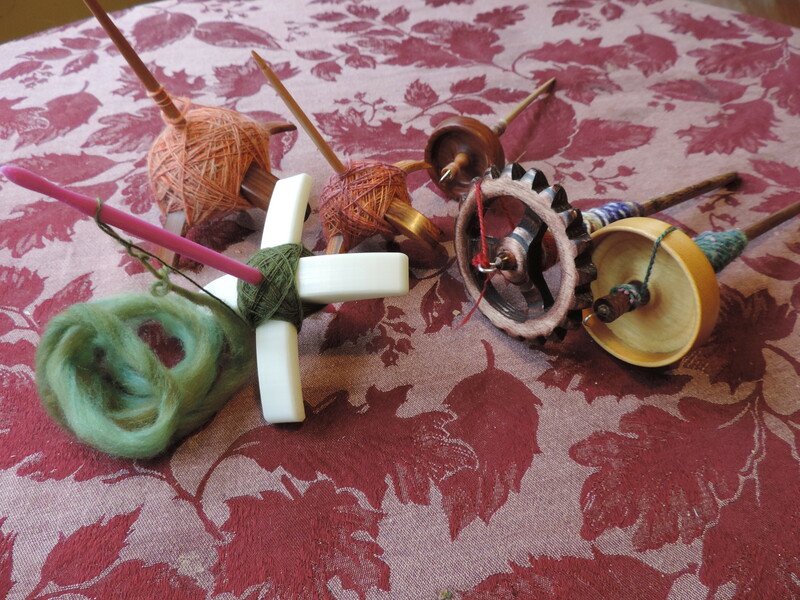 The same way that if I want to make soft singles using my Ashford Joy, I’ll set it on the largest whorl – so there are fewer revolutions per treadle and set my tension for a slightly stronger uptake. 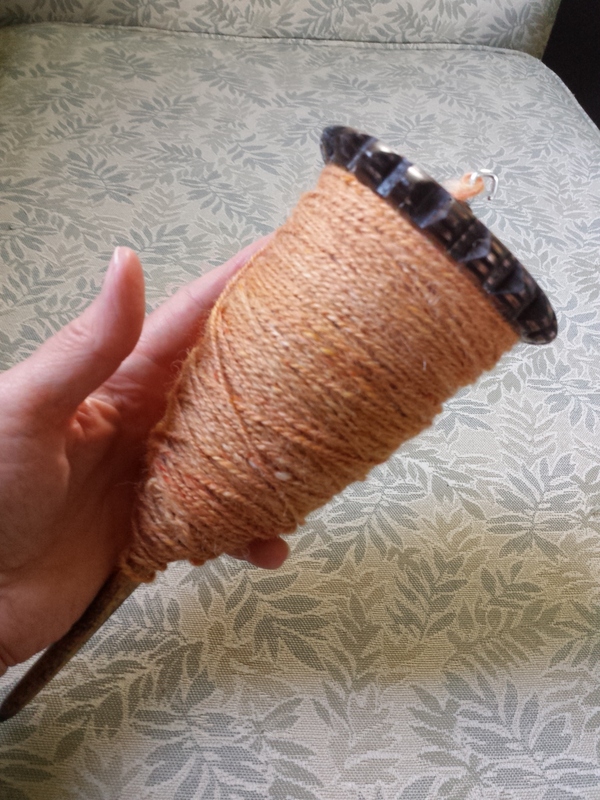 If I want to spin for socks and I’m making a three-ply sock yarn, I’ll change to my smallest whorl so I get more revolutions per treadle, and slow the uptake down so a lot of twist can get into the finely drafted singles yarn. It’s easier to change your whorl and uptake than it is to change what your body does. Because of body or motion memory, we easily and quickly go back into the rhythm we generally use to spin – hence the phenomenon of default yarn. 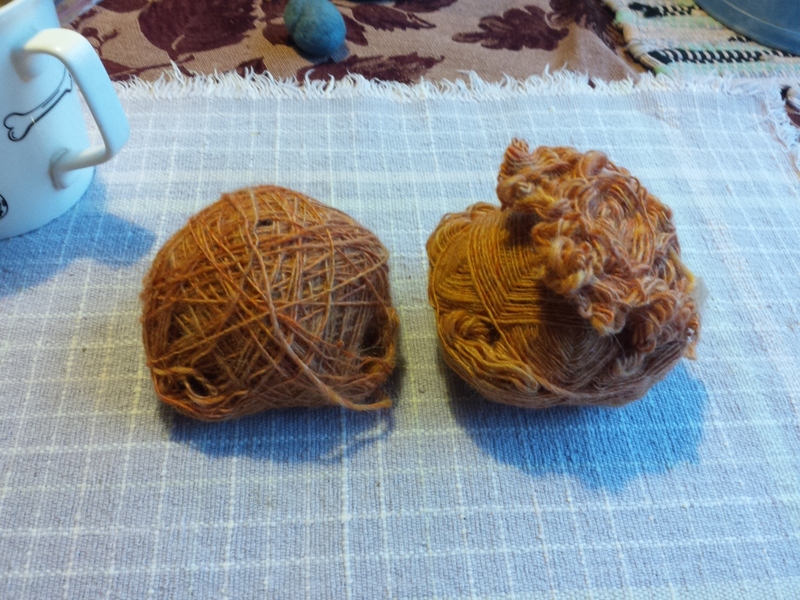 So using the same principle, I change my spindle to get a different result for a different kind of yarn. 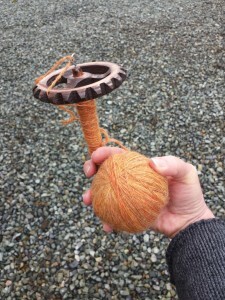 The Steampunk spindle, shown below, is a terrific spindle for making singles and especially for plying. 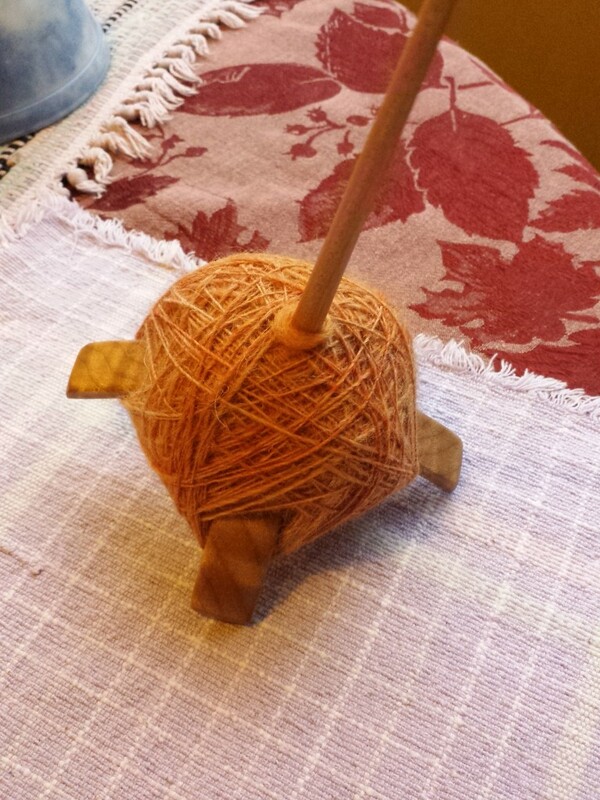 Since it is large and can fit 4 ounces (and probably more) plied yarn onto it, it has become my go-to plying spindle. No messing around with the smaller ones. This one is the King! They are beautifully crafted, often made from exotic woods, and are delightful to look at and hold. For the most part, the ones I own are made by artisans I have had conversations with and are people I want to support in their craft. Here’s a small sampling of some of the spindles. There are a few more tucked away here and there in my studio. PS – I reached a point last week after ordering more spindles, that I had to stage an intervention on myself. That consisted of deleting the Etsy app from my smartphone! This entry was posted in Uncategorized on April 23, 2016 by DianaTwiss. Spinning, plying, flying oh my! This week I flew to Castlegar, BC for a conference presentation in Nelson. 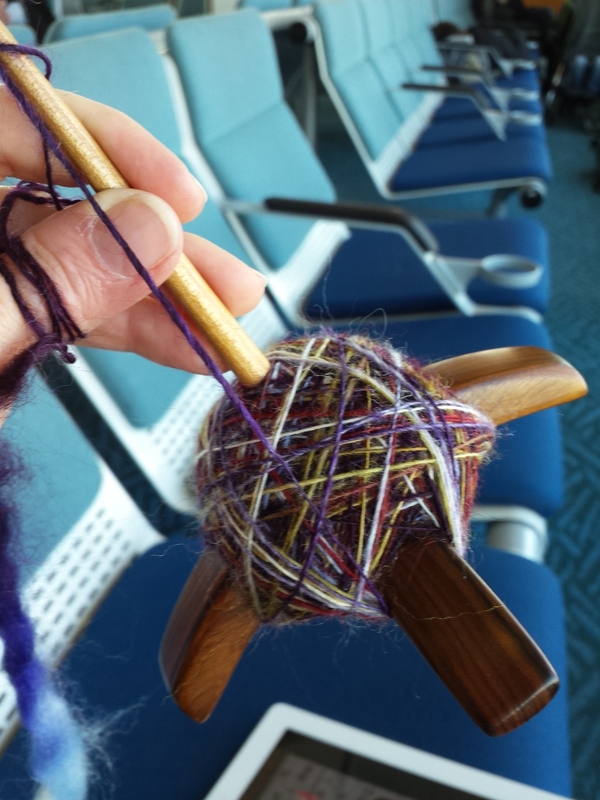 While waiting for my flight, I finished spinning the last bit of my Wistmas fibre on my Jenkins Turkish spindle and was contemplating plying while on the plane. I had another similar sized turtle spun up and waiting for its mate. 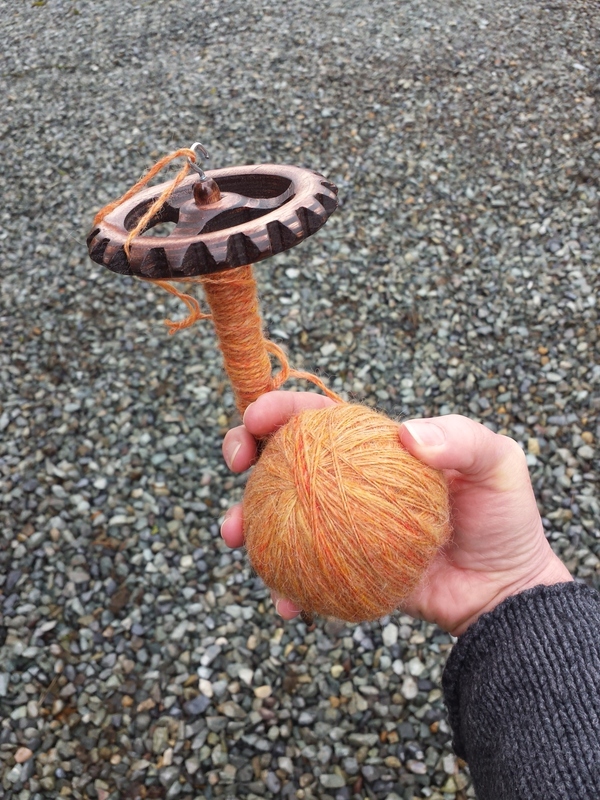 It’s a one-hour flight from Vancouver to Castlegar so I knew it was a perfect escape to wind the double-stranded ball from the turtle spun a week or so ago and the newly spun one. What’s the “key word” that could have/should have set off alarm bells for me? It was just the last 2 grams or so I swear, but man-oh-man, it made my winding experience hell. Fortunately I was sitting all by myself so I didn’t get the chance to enjoy the experience with anyone else. I had a small felted ball at the ready, took the beginning strand (the one that we push into the arms with the shaft) from each turtle and started casually and happily winding a two-stranded ball. It went well for a good while. I listened to music. I looked out the window at the snow covered mountain ranges. I thought about what I wanted to do with this lovely yarn once it was made. I wound and wound. The ball got larger and larger. During that time I thought I may even have time to ply the yarn during the flight. It was at this high point of optimism and over confidence that things started to go wrong. Seriously wrong. 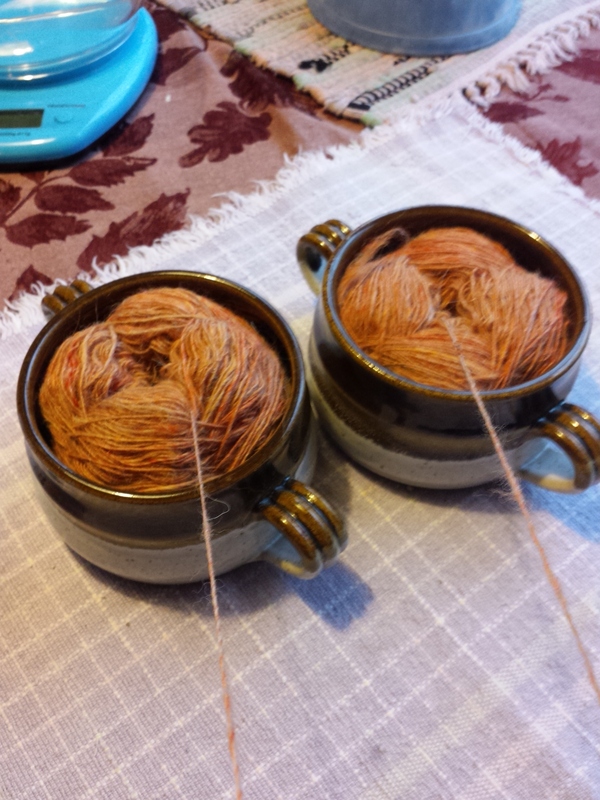 Singles from the newly spun turtle started coming out in small tangles. Clumps of them at a time. I was able to manage them at first by creating a tensioning sytem by wrapping the singles around my leg. It worked for a short while. I can’t even begin to describe how I got most of it done. It wasn’t a pretty sight. I had a two-stranded evenly wound ball in my right hand, and in my left hand and wrapped around my leg to hold it in place I was trying to untangle a twisted mess of singles. 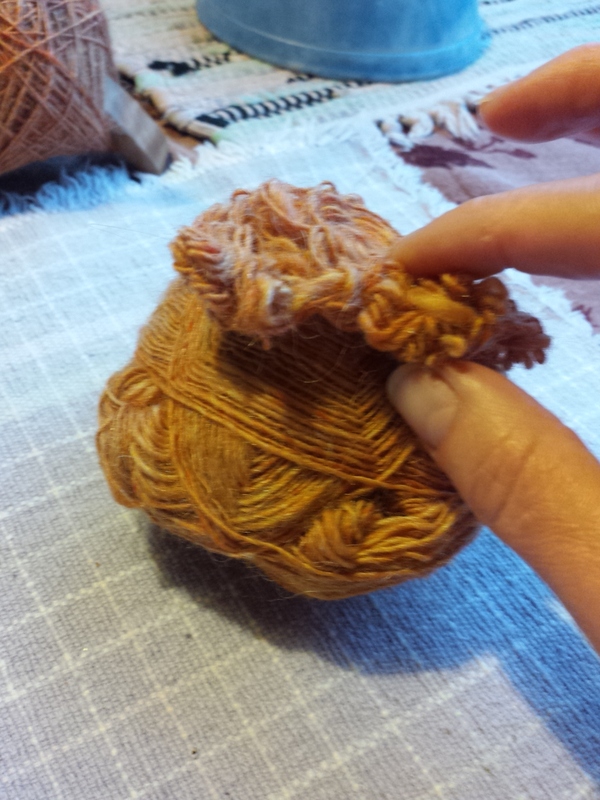 And because I was fully ensconced (well maybe not securely or snugly – I was in deep) with both hands full of the yarn, I couldn’t take photos. When the flight attendant came along to offer snacks and beverage, at one point of this horribly frustrating activity adventure, I hid my mess for fear she would consider it a safety issue and confiscate it. I told her I didn’t need anything. Please note: I gave up the Air Canada pretzels and free Ginger Ale for art! I was born in the Year of the Ox. I am persistent and determined (my good qualities). Or some family members will say stubborn. No matter, I got through it. For the sake of sanity I abandoned the last several yards of one of the singles. I just couldn’t do it. If I can I will let my singles sit. If my singles yarn is particularly fuzzy (because I didn’t smooth out the yarn as I spun it), I will be prepared for it to stick. In that case, it especially needs to have the twist settled before plying – or doing any of the prep for plying like making a double-stranded ball. If you are trying to make yarn in a place that doesn’t understand yarn making, like on a plane, don’t expect to have special compensation. [“We are starting our descent, you will need to put that away and get yourself more . . . . .organized.” — poor, sweet woman, she couldn’t quite describe what needed happen to make it right.] Rest assured, I complied. So the long and short of it is: air travel gives us a great amount of time for spinning and knitting. However, we need to carefully consider the scope of our projects so we can make the best use of this time, escape from the boredom of waiting and maximize the potential for relaxation. That last phrase makes me laugh! It wasn’t a total disaster. But I did lose several yards of yarn that I may very well may need for this special skein. I have a large double-stranded ball that will be plied this weekend. NOT ON A PLANE . But at the Bradner Flower Show. This entry was posted in Uncategorized on April 10, 2016 by DianaTwiss.